We have went over alot so far, havn't we? You should now be aware of the amount of complexity there is in OS development. And yet--it only gets harder. The demo itself is completed. It will be shown in the second part of this tutorial, along with an overview of the completed Stage 2 source code, including its new little FAT12 driver, Floppy driver. These are not "real" drivers by definition that we will add. However, they will help demenstrate the functionality of drivers, and why they are usefull. All of the code is a heavily modified version of our FAT12 loading code from the bootloader, so I will not be describing FAT12 again in detail. With that, Part two--as being the last tutorial for Stage 2--will go over the loading and executing of a basic (pure binary) Kernel image at 1 MB. This tutorial references The infamous Tutorial 7 alot. That is, the Real Mode Addressing Map and Default I/O Port Addresses. It may be helpfull to have that tutorial up when we talk about video address space and VGA port access. The Video Graphics Array (VGA) is an anolog computer display standard marketed in 1987 by IBM. It is called an "Array" because it was originally developed as a single chip, replacing dozens of logic chips in a Industry Standard Architecture (ISA) board that the MDA, CGA, and EGA used. Because this was all on a single ISA board, it was very easy to connect it to the motherboard. The VGA consists of the video buffer, video DAC, CRT Controller, Sequencer unit, Graphics Controller, and an Attribute Controller. Please note that, we will not cover everything in detail yet until we start talking about video drivers. This is primarily to preseve space, and to make things more easier as programming the VGA can get quite complex. The Video Buffer is a segment of memory mapped as Video Memory. We can change what region of memory is mapped to video memory. At startup, the BIOS maps it to 0xA0000., which means that video memory is mapped to 0xA0000. (Remember the Real Mode Address Map from Tutorial 7?) This is important! The Video Digital to Analog Converter (DAC) contains the color palette that is used to convert the video data into an analog video signal that is sent to the display. This signal indicates the red, green, and blue intensities in analog form. We will go into more detail later, so don't worry if you do not understand this yet. This controller generates horizontal and vertical synchronization signal timings, addressing for the video buffer, cursor and underline timings. We will go into more detail later in this tutorial, as we need to go through the CRT Controller when updating the cursor. This is the interface between video memory and the attribute controller, and between video memory and the CPU. During active display times, memory data is sent from the video buffer (Video Memory) and sent to the Attribute Controller. In Graphics Modes, this data is converted from parallel to a serial bit plane data before being sent. In text modes, Just the parallel data is sent. Don't worry if you do not understand these yet. I do not plan on going into much detail here. We will cover everything in detail later when we talk about developing a video driver. For now, just remember that: The Graphics Controller refreshes the display from the parallel data from video memory. This is automatic based on the active display times. This simply means, that By writing to video memory (Default mapped to 0xA0000) we effectivly write to video display, depending on the current mode. This is important when printing characters. Remember that it is possible to change the address range used by the Graphics Cotroller. When initializing, the BIOS does just this to map video memory to 0xA0000. A "Video Mode" is a specification of display. That is, it describes how Video Memory is refrenced, and how this data is displayed by the video adapter. The VGA supports two types of modes: APA Graphics, and Text. All Points Addressable (APA) is a display mode, that, on a video monitor, dot matrix, or any device that consists of a pixel array, where every cell can be refrenced individually. In the case of video display, where every cell represents a "pixel", where every pixel can be manipulated directly. Because of this, almost all graphic modes use this method. By modifying this pixel buffer, we effectivly modify individual pixels on screen. A "Pixel" is the smallest unit that can be represented on a display. On a display, it represents the smallest unit of color. That is, basically, a single dot. The size of each pixel depends heavily on the current resolution and video mode. A Text Mode is a display mode where the content on the screen is internally represented in terms of characters rather then pixels, as with APA. A Video Controller implimenting text mode uses two buffers: A character map representing the pixels for each individual character to be displayed, and a buffer that represents what characters are in each cell. By changing the character map buffer, we effectivly change the characters themselves, allowing us to create a new character set. By changing the Screen Buffer, which represents what characters are in each cell, we effectivly change what characters are displayed on screen. Some text modes also allow attributes, which may provide a character color, or even blinking, underlined, inversed, brightened, etc. Remember that VGA is based off of MDA, CGA, and EGA. VGA also supports alot of the modes these adapters do. Understanding these modes will help in better understanding VGA. Back before I was born (Seriously :) ) in 1981, IBM developed a standard video display card for the PC. They were the Monochrome Display Adapter (MDA), and Monochrome Display and Printer Adapter (MDPA). The MDA did not have any graphics mode of any kind. It only had a single text mode, (Mode 7) which could display 80 columns by 25 lines of high resolution text characters. This display adapter was a common standard used in older PC's. In 1981, IBM also developed the Color Graphics Adapter (CGA), coinsidered the first color display standard for PC's. It is possible to treak the display adapter in creating and discovering new, "undocumented" video modes. More on this later. Introduced in 1984 by IBM, The Enhanced Graphics Adapter (EGA) produced a display of 16 colors at a resolution up to 640x350 pixels. Remember that the VGA adapters are backward compatible, simular to the 80x86 microprocessor family. 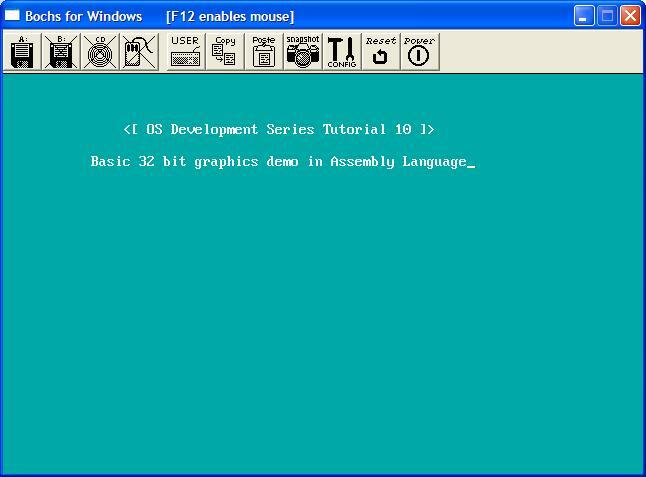 Because of this, and to insure backward compatibility, the BIOS starts up in Mode 7 (Originally from the MDA), which supports 80 columns, by 25 lines. This is important to us, because this is the mode we are in! Video memory used by the VGA Controller is mapped to the PC's memory from 0xA0000 to 0xBFFFF. Remember the Real Mode Memory Map from Tutorial 7! Do to the different addresses used in the memory mapping, it is possible to have both ECG, CGA, and VGA display adapters installed on the same machine. It is possible to change the memory mappings used by the video adapter cards through the CRT Microcontroller. Normally this is done through Video Drivers. More on this later, though. One can also modify how the Video Controller uses this memory. In doing so, we can create "new", or rather, "undocumented" modes. One common mode is the infamous "Mode X". For an example, remember that we are in Mode 7? Mode 7 is a color text mode, hence uses memory that begins at 0xB8000. Because this is the text buffer used by the Video Controller to determin what to display, Writing to 0xB8000 effectivley displays text on screen. Okay, so how do we print a character at any x/y location on screen? A special property about memory is how it is linear. If we reach the end of a line being displayed, the next byte is on the line right below it. Because of linear addressing, we have to be able to convert an x/y location to a linear address to render it to screen. And, a special forumula to do that is: x + y * screen width. This means, from the start of video memory, location 5,5 is 405 bytes away. So... by writing character 'A' to 0xB8195, we effectivly write to x/y location (5,5). Cool, huh? Remember that we are in Mode 7. This mode has 80 colums of characters per row, and 25 lines. And, of course, video memory begins at 0xB8000. But wait! What is the character attribute? Text Mode 7 actually uses two bytes per character, not one. Remember this! The first byte represents the actual character, and the second byte is a ...wait for it... attribute byte! Because of this, when writing a character to screen in Mode 7, you will need to write two bytes, not one. Okay, now that we have everything set up, lets print a character! Printing characters is a little complex because we have to track where we are, both in current x/y location and when writing to video memory. We also need to track certain characters, such as the newline character, and to watch for the end of line. And yet, we still need to update the hardware cursor to this position as well. Putch32 is the pmode routine that will display a character in stage 2. Don't worry, we will rewrite these routines for the Kernel using C. By showing how it's done in assembly, we can compare assembly language relationships with C. More on this later. Okay, we have some basic definitions. _CurX and _CurY will contain the current x/y location to write the character to. By incrementing _CurX, we effectivly go to the next character in the line. Also note that EDI contains the base address of video memory. Now, by writing to video memory [EDI], we an display characters on screen do to the current video memory map. Before displaying characters, we have to find out where to display it. To do this, just write it to the current x/y location (_CurX and _CurY). This is not quite simple though. As you remember, video memory is linear, so we have to convert the x/y location into linear memory. Remember our formula x + y * screen width. This can be easily computed. However, remember that every character is two bytes in size. Remember that _CurX, _CurY, COLS, LINES, are based off characters, not bytes. i.e., COLS=80 characters. Because there are two bytes per character, we have to compare with 80*2. Simple, huh? ; Remember: currentPos = x + y * COLS! x and y are in _CurX and _CurY. ; Because there are two bytes per character, COLS=number of characters in a line. This is the first part of the formula: y * screen width (in bytes), or _CurY * (COLS*bytes per character). We store it on the stack so that we could finish the formula. Okay then! Notice that we multiply _CurX by 2 to get the current byte location. Then, we pop the result of y * COLS and add it to the x position--completing our x+y*COLS formula. cmp	bl, 0x0A		; is it a newline character? cmp	[_CurX], COLS		; are we at the end of the line? To print actual information, we will need a way to print full strings. Because we already have a routine that tracks current position (and updates it), and prints the characters, all we need to do to print a string is a simple loop. Okay, Heres our Puts32() function. It takes one parameter: EBX, which contains the address of a null terminated string to print. Because out Putch32() function requires that BL store the character to print, we need to save a copy of EBX, so we do it here. cmp	bl, 0			; is it 0 (Null terminator)? Voila! We got ourselves a way to print strings in 32 bit protected mode. Not to hard, is it? Oh wait.. What is MovCur for? We will look at that next. Okay, so we can print characters and strings out now. You might notice something though: the cursor does not move! Because of this, it just stays no matter what we do. This cursor is a simple underline that the BIOS uses to indicate the current position when printing text. This cursor is handled by the hardware. The CRT Microcontroller, in fact. So, we have to know some basic vga programming in order to move this cursor. While I incourage practicing and trying new things, please remember that, in an OS envirement, you are working directly with the hardware, and have direct control over everything. CRT Monitor failures are violent in nature, and can explode and produce sharp glass fragments to fly at high speeds. It is possible to change frequency settings greater then the devices can handle. This may increase the chanches of a device or microchip to malfunction, producing unpredictable or desasterous results. Because of this, if you, the reader, like experementing with the code, I recommend testing all experemental code in an emulator to its fullest first, before attempting real hardware. I will not explain everything reguarding video programming yet until we talk about Video Drivers. We will look at everything in detail then, cool? Anywhoo...On to the CRT Controller! The CRT Controller uses a single Data Register which is mapped to port 0x3D5. Remember the Port table from Tutorial 7? The CRT Controller uses a special register - an Index Register, to determin the type of data in the Data Register is. The Index Register is mapped to ports 0x3D5 or 0x3B5. The Data Register is mapped to ports 0x3D4 or 0x3B4. There are more registers then these two (Such as the Misc. Output Register), but we will focus on these two for now. Yippe! These indices refer to the current offset location of the hardware cursor. This offset is just an x/y location (as a linear location - remember the formula x + y * screen width! ), split into its high and low bytes. This sets the new low byte location for the cursor! Cool, huh? Setting the high byte is exactally the same, except we have to set the index to 0x0E, which is, again, the high byte index. Next up: Clearing the screen! I decided to create a little demo to demenstrate everything in this tutorial. The next tutorial builds directly on this code. This tutorial uses everything we talked about in this tutorial. It sets the foreground and background colors based on the character attribute byte. And, because of our ClrScr32() routine, effectivly clears the screen to that background color. Cool, huh? I was pretty stumped on how to go about these next tutorials. I believe (Hope!) splitting it in two parts was a good solution. The next tutorial finishes Stage 2, and loads and executes a basic pure binary 32 bit Kernel image at 1 MB. Don't worry--When we get into the Kernel section of this series, we will change the way the Kernel is built, and modify how it is loaded. This will allow us to load the Kernel as an object format--allowing it to import or export symbols, and mix it in with C. I cannot wait! The next tutorial is not a tutorial in a sense of learning new things. Instead, it covers all of the code that has already been explained. This code, however, is modified for better code layout, and provide the interface (and seperation) between a basic FileSystem (FAT12) Driver and a Floppy Driver. Nontheless, it is the closing tutorial for Stage 2.